On Saturday July 11, Saturday Morning Footy ventured across the Potomac to run a session on the National Mall. The weather looked grim but cleared by the time start time rolled around. It was our annual "Specky Session," one of the favorite sessions of the year. The boys and girls practice taking great marks (catches) using tackle bags to substitute for opposition players (or team mates). The key to a great specky is breaking it into two parts. The first part is jumping on the bag and using as leverage to rise up or to remain above your opponents. The second part is to reach up for the ball. It took a little bit, but the players were able to get the hang of it and take some great grabs. After working on speckies, Coach Danny took the players through the basics of rolling and falling, both very important skills in Australian football. The session ended with a match. The standard of football this year has been really fantastic. The ball movement and the kicking to a team mate's advantage were excellent. Saturday July 18 we are back at BLUEMONT PARK. Thanks to Stuart Barkoff for the great photos. More PHOTOS ON FACEBOOK. We are back from break this Saturday July 11 with a special session at West Potomac Park in Washington DC. We will begin at the normal time, 9am, and run until 10.30am. Because our first attempt at Specky Week was rained out, we will be doing Specky Week. I hope everyone has been practicing their big leaps! This special session will be followed by the big game between the #18 Baltimore Washington Eagles and the North Carolina Tigers. Eagles are 0-1, while the Tigers are 1-2. Last year each team won on home soil. It should be great game. Please bring a picnic and come out and join us. Saturday Morning Footy hopes everyone has a great 4th of July holiday. Stay dry or cool and enjoy the fireworks. 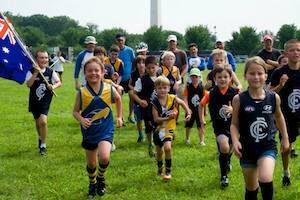 Saturday Morning Footy will be back July 11 with a very special session at West Potomac Park in our Nation's capital. The session will begin at 9am. 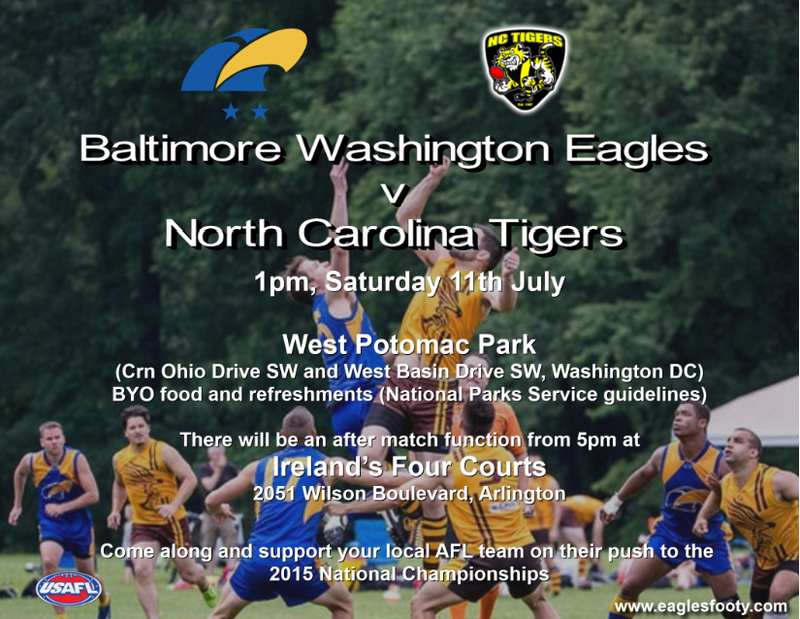 At 1pm the #18 Baltimore Washington Eagles take on the North Carolina Tigers. Bring and picnic. Come out and support your home town Eagles. Picture: SMF Coach, Jay Levesque, sings the National Anthem with his US Revolution team mates. Arlington County has closed all fields today. There will Eagles Practice at 10am at West Potomac Park in DC. Kids are welcome. It was a huge first session. 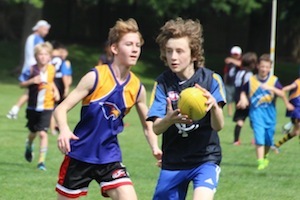 We had about sixty boys and girls participate in the first session of Saturday Morning Footy on June 13. It was the biggest session we have had for a number of years. Thank you to our great volunteer coaches including Mick, Paul, Alex, AJ and Seth. Thanks to all the parents who helped out and the Eagles players for pitching in. Thanks to Lee-Ann, Alison and Jackie for providing snacks. Thanks to Rachel and Jackie for washing jerseys. Next session is Saturday June 20 at Bluemont Park. Photo: Deena Ackerman. More photos HERE.